For decades, Italian motorcycle manufacturers have provided pristine products. In an ever-expanding array of shapes and sizes, their common denominator has always been style. Such machines certainly passed through a set of factory gates in Rimini - those belonging to Bimota. 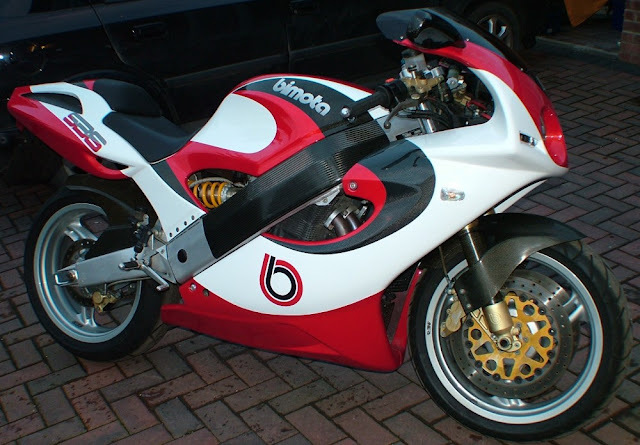 Over the years, Bimota have used a variety of proprietary powerplants ... Suzuki, Kawasaki, Ducati ... and mated them with their own bodywork and cycle parts. In the case of the SB6, it was Suzuki's GSX-R1100 motor which piled on the coals - up to a top speed of 175mph! The names of the three men who founded the firm were Bianchi, Morri and Tamburini - voilà, 'BiMoTa'. It was only right that they were so acknowledged. For 30 years, Bimota have pushed the envelope - of performance, development, and design. The SB6 was testament to that.